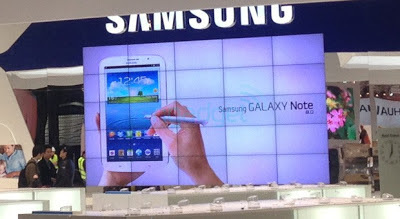 And just like magic the doors at MWC open up and up pops Samsung's Galaxy Note 8.0! There's not much more to add to this story at this exact moment, except that it'll have that good old stylus support, there's still Touchwiz on board and it'll definitely be getting a lot more attention over the next few days! Any one want to speculate what will be on the inside here? One thing we would have loved would have been if the device was in landscape, we're still not fans of portrait tablets! Let us know your thoughts in the comments below!